Everyone seems to have an opinion as to whether the craft brewing industry will experience a bubble. Most of this speculation is fueled by the shear growth of so many new breweries. I've weighed in on the subject myself and I'll spare you the details of pouring through my number heavy analysis if you don't want read through it and just give you the conclusion. I estimated that given so much new brewing capacity coming on line that the craft brewing industry would have to continue to grow sales volume at an annual rate of 15% for all that beer to be sold. If the craft brewing industry slowed to a 5% or even 10% percent growth rate over the next couple years, there would be so much excessive capacity coming online the many breweries would have a hard time selling enough beer to meet their financial obligations. Most have taken on debt to fund their expansions, so if they can't sell enough beer to pay off the debt and operating expenses, they're in a lot of trouble. Over time, a lot of breweries could end up going out of business and I made a semi-wild guess that two or three hundred breweries could exit the industry in the next couple years, higher than the current 1-2% failure rate of craft breweries. 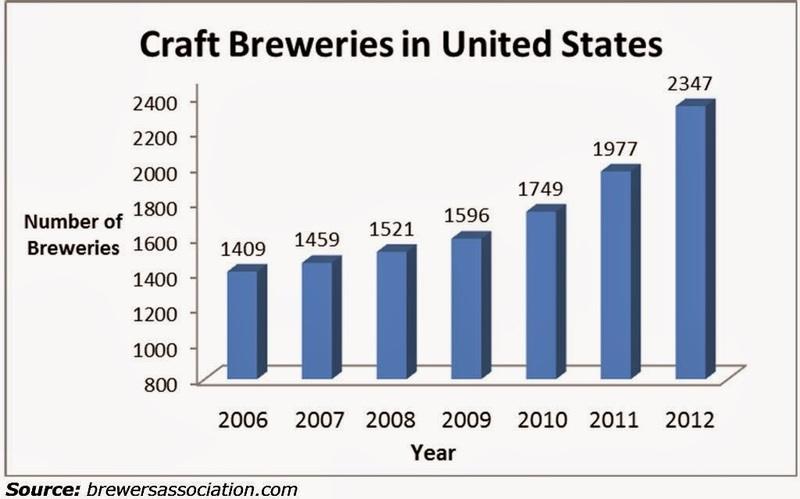 The good news is that the astonishing recent growth of craft beer sales hasn't slowed, but has inexplicably increased. A recent press release by the Brewer's Association reports an 18% volume growth and a 20% revenue growth in 2013. These are just amazing numbers. Rarely does growth in any industry, let alone a fairly mature one like beer, reach these anything close to these growth levels. Most businesses are elated whenever they achieve 10% sales increase and seldom does this happen year after year after year. Bottom line: As overheated as the craft brewing industry seems right now with so many new breweries and brewery expansions, this industry-wide capacity growth seems sustainable in the near term given the 20% increase in revenue growth in 2013. With craft beer still occupying only 7.8% of the beer market, it's hardly to the point of saturation. So a 20% growth rate is still plausible for at least the next two or three years. Maybe the growth will slow, but there's really no compelling reason why. If the industry ever experiences a shake out with many breweries going out of business, that day of reckoning, if it ever comes, seems further off in the future. A review of "Craft Beer for the Homebrewer"